So you get Windows 10. You share your media libraries so other users on your network can see and play your music from Windows Media Player on their own puters. Unfortunately, when they try to browse your music, WMP connects but quickly declares that your media library is empty! At least in the November update for Windows 10 (version 1511), you need to either create a new HomeGroup or join an existing one on your local network. I know, I know, you’re not using a HomeGroup! You’ve got a multi-OS local environment, so you’re just using regular old “Samba” sharing. Still, if you enable the HomeGroup nonsense, your media sharing will start working normally again. 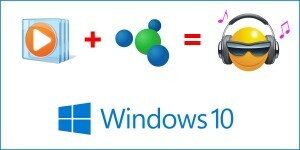 Note that you (in Windows 10) will not have a problem playing other puters’ media via Windows Media Player. But they won’t be able see or play yours, whether they’re running Windows 7, Windows 8, or Windows 10. If it says, “You’ve been invited to join a HomeGroup”, then click the Join now button. You’ll need to get the password from whoever set up the HomeGroup on your network. Otherwise, follow the prompts to create a new HomeGroup, and set a password yourself. Now try accessing your media library from another puter on your local network. You should be able to see your music and other files from someone else’s Windows Media Player. Don’t ask me what’s going on here, but it works!